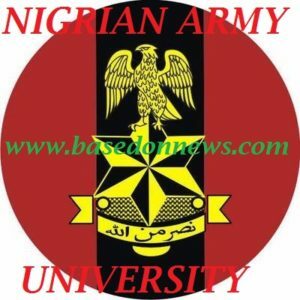 Nigerian Army University Biu (NAUB) 2019/2020 Admission Requirements, Courses Offered (Departments) in Nigeria Army University Biu , Post UTME Date and Registration, Steps on How to Apply or Register for Nigeria Army University Biu (NAUB) – This is to officially inform you of 2019/2020 Admission procedures for Nigerian Army University Biu (NAUB) to enable you apply or register successfully. All you need to register or get admission in NAUB are all stated in this article below. 0.1 Is NAUB in JAMB? Yes, NAUB is now in JAMB. Before you would be admitted in NAUB, you must have chosen the school as your First Choice while registering JAMB. The general JAMB cut off mark that would qualify one for admission in NAUB is 180 and above. Must i come to borno for my utme?